While we were slacking one of our neighbors was taming the swamp. (I think his name is Robert.) This view is from the same tree, looking towards the beach, a little towards the Waianae Range and Kaena Point. 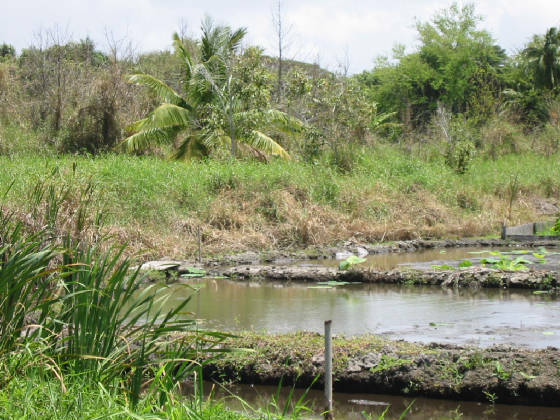 His high ground where the shade structure, bird cage, lawn, and banana plants are is filled land, well above the swamp water level. I think the filling was done long ago, when the "island" was built. 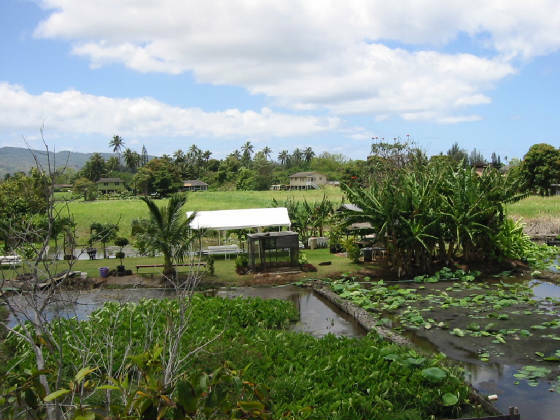 He is surrounded by well-tended lo'i, growing both taro (left) and hasu (right). The lo'i are at about our elevation, kept flooded with pumped water. Jim saw them with an excavator clearing these lo'i a few years ago. This is how we look from our neighbor's lo'i. The coconut tree will help you home in on us. The cypress trees are mostly just a high jumble of California grass. Here is a collage made from about 3 tax maps. Our lot looks like a piece of pie. ("Driveway options" points to us, from IGA side. 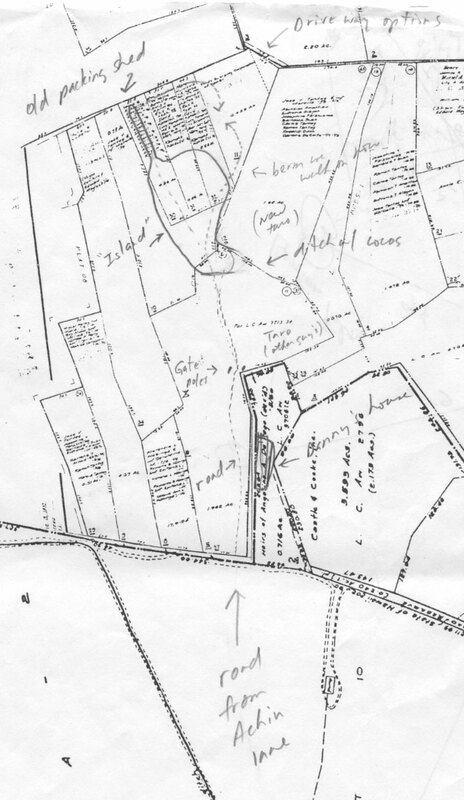 These notes are part of a survey with Joseph Duettra 2-9-01 to plan a driveway and garage, supported by cypress trees, so we could eventually drive up to the house. This was back when we assumed access would most likely be from the "island", so we planted trees in the option at the pointy end of our lot. We did a good job on that planting and layout, and a fair job of tending the new trees for a few years. But now most are probably lost in the last few years. When we clear again, we may be able to use some of the survivors to make the new access on the IGA side.) What I wanted to show now is the neighbor with the well-tended lo'i is shown as a finger sticking out from the island. The end of the finger says "old packing shed", which is what was there back then, mostly buried in California grass. 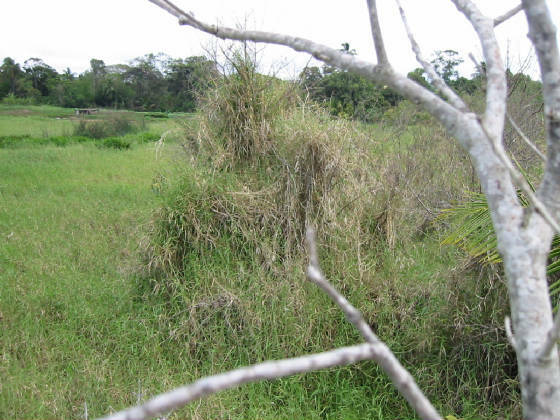 In the years when we managed the California grass well, we did it with a Roundup-cattail strategy. If you just spray it with Roundup your border will always be a dead wall of grass. So we moved that border back 10 more feet, and planted a row of cattails in the honohono, to be a green screen between us and the dreaded CA grass. A new strategy to perhaps test could use a gas hedge trimmer. Make a pathway berm on the border, and just walk it once a month or so trimming the hedge of green CA grass. 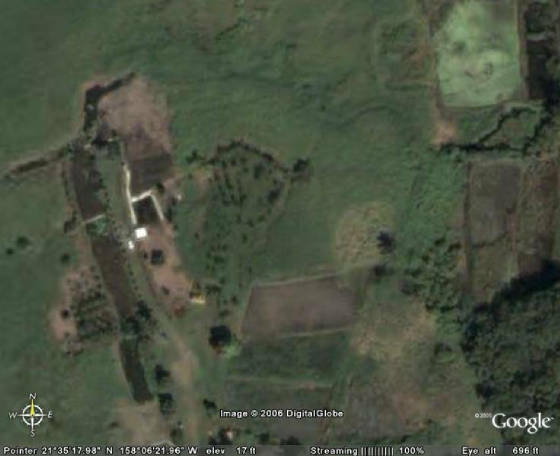 Here, compliments of Google Earth, you can make out our plot with trees in the center, and Robert's maintained area on the left.